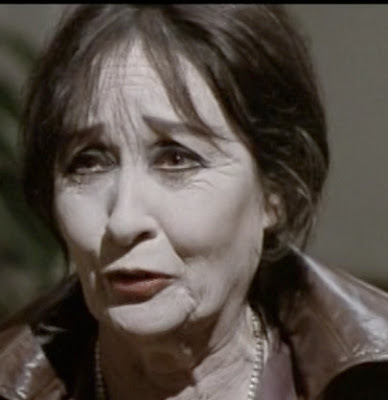 The Horror Digest: Deep Red: A Study of Color and What Snooki Will Look Like When She's 50 Years Old. 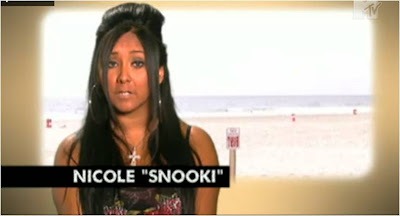 Deep Red: A Study of Color and What Snooki Will Look Like When She's 50 Years Old. 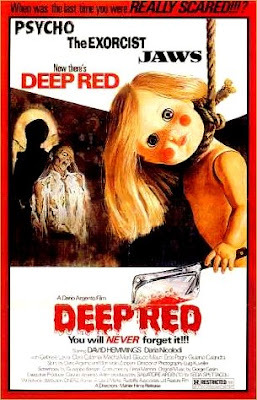 If you caught me twittering today than you may have heard me mention that Deep Red was my second favorite Argento film. Behind Suspiria and before Phenomena. Today's version that I have watched unfortunately is not one I have seen- but I do believe it is the one I've heard many people refer to. 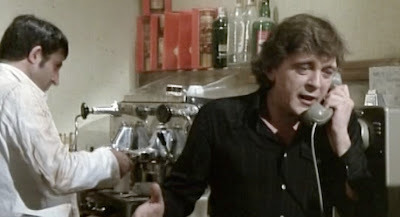 It's an extended Italian version in which there are many scenes that suddenly switch from being dubbed in English to being subtitled in English over Italian actor's with much more interesting voices. Have you ever heard Daria Nicolodi's real voice? It's actually quite pleasing- compared to the awful dub she usually gets. It's a pity than that they only chose to do that on this version because to be honest it's just too long! All longness aside, I was still able to grasp the very idea of why I love this film so much; which of course is because it's so RED. Notice the intense way Lady GaGa here is putting on her bright RED lipstick. Think she has enough on? Now remember the way the red looks splashed on her lips as we take a look at each of the murder victims. Pretty nifty huh? Sure these murder victims may not have been as exact when applying their lipstick but it's till pretty uncanny. 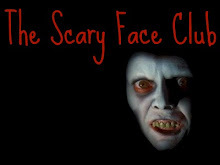 This my friends is the very proof of beauty in blood, and beauty in horror and film making. 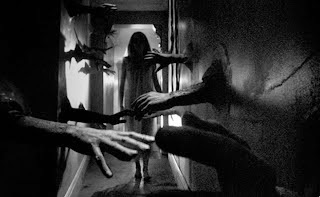 Say what you will about his story work and plot holes- but Argento can make a picture happen. 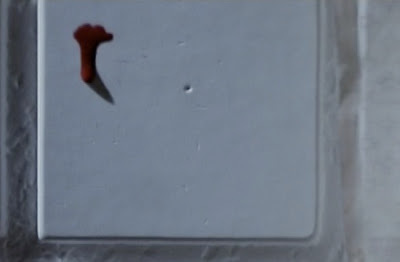 The other very moving thing I find with Deep Red- is that I believe a large part of why the color is so significant has to do with the traumatic experience our murderer has- or the witness to the initial murder perhaps. Seeing a "deep red" blood like that has to terrify you. The red in this movie works the same way that it does in Hitchcock's, Marnie- except it is the audience that is more affected by it than the character. Due to this it makes sense then that all the red is "deep" since it remains so deeply engraved into our minds and into the witnesses mind. Now the other reason I love this film has to do with those damn creepy dolls. Can you honestly think of anything creepier than coming into your house and finding this? Yeah didn't think so. Oh wait except coming home to find this doll RUNNING at you. Sweet Jesus this scene and this doll will never be fully out of my head. How does it run like that? What is the meaning of this atrocity?! 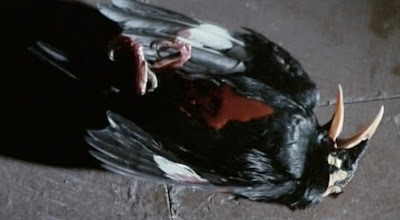 Alright so even though the film is packed to the brim with fantastic imagery there are still some confusing scenes, plot holes and just all around strangeness that we often find in Argento's films. But like I've said before when I watch an Argento film, I'm watching it for the artistry and the imagery rather than a plot that makes sense. 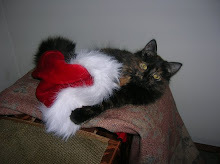 I believe this is the trouble people get into when they are looking for love with Argento. They want to love him but can't get past those often strange plots that don't seem to make sense. My suggestion is- ignore most of the plot- and focus on the beauty! Why else do I love this movie? Let's see... The super creepy opening of the film, the intentional gender mix up when showing close ups of the killer, the bathtub murder, the opening murder and the glass in the neck, the creepy little girl who sticks needles in lizards, the killers fascination with dolls, that damn creepy song, the killers fantastic death scene, the way the window eerily opens up and makes the steam in the bathroom disappear, and the death of Carlo- that happens right after this amazing picture of his face is shown to us. 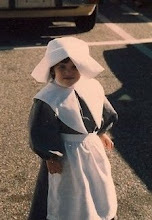 Oh and look what I found.....a flash forward into Snooki's life. This picture only proves my prediction that by the time she reaches 60 her self tanner will have absorbed into her skin killing all pigmentation and rendering her grey. Oh boy I can't wait! Buy Deep Red at Horror Movie Empire! I just recently received a promotion card for a band called [:SITD:] and their new album is titled Rot, German for red. On the card it described the significance of the title, namely that red is the color of blood, passion, desire, rage, rebellion. The album art features a dark seascape and a red flag with the band's logo. It really pops. Red influences appetite as well. Apples, tomatoes, strawberries, cherries. Even if you don't like said fruits (is tomato a fruit now? They keep changing their mind on that) somehow you salivate. Table clothes in restaurants are often red. LOVE Deep Red! Just watched it this past weekend again. I always like the way Argento puts "You've been watching Deep Red...Suspiria...Tenebrae, etc..." at the end of his films, as if you could forget. 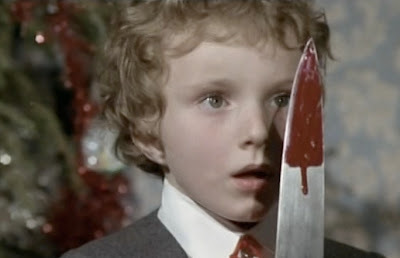 His use of bright blood is quite legendary - you always know it's an Argento. And those freakin' dolls! I have intense,INTENSE hate for any dolls whatsoever, and these ones? 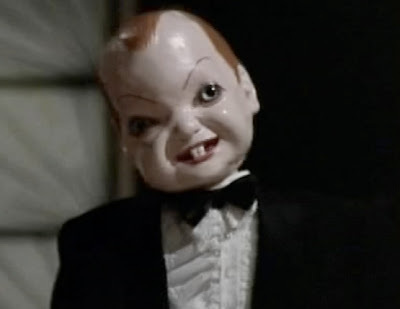 Ive always said that the doll from the Saw movies came straight out of Deep Red. Great way to elaborate on Argento's style. He makes films to be appreciated for their stunning visual imagery, not their narrative logic. I once heard it put best in reference to Fulci's The Beyond: "It's a film of images meant to be absorbed without reflection." 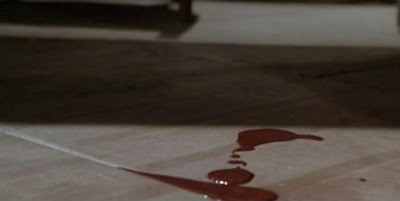 Im sickened by the violence and gore in Deep Red. The human actors werent really killed but there is real animal abuse in this movie. A Mynah bird is killled and at least one unknown lizard is killed. This is offensive. The makers of this movie should be prosecuted. Where is Peta when you need it? Im angered by this movie. Deep Red is sickening. It has cool awesome music from the Goblins. 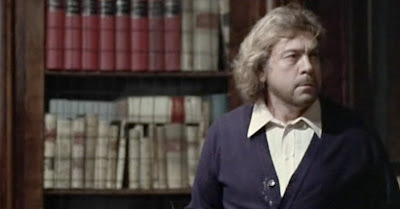 David Hemmings and a psychic woman restart a murderer's killing spree. The murderer is actually an old woman who years earlier killed her husband in front of her son. Her son grows up to be an alcoholic. 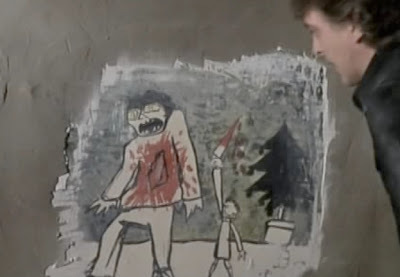 We see disturbing pictures drawn by either the killer or her alcoholic son. The killler identifies herself at the end to David Hemmings and tries one last time to kill him but ends up getting her necklace stuck on an elevator and gets strangled to death. The violence and gore is graphic. The surprise here is learning that the killer who commits these horrifically brutal violent crimes is an old woman. Murderous slashers with a violent streak are usually male. Gabriele Lavia and Macha Meril also star in this famous or infamous movie. Its scary and disturbing. This movie is a horror/mystery. The violence is repellent.